Directorate Of Elementary Education, Assam Recruitment 2019 March - Grade IV Peon/ Night Chowkidar 149 Posts :- Welcome to North East India's No. 1 Job Portal NeCareer.com . Today we will be talking about a new job notification in the state of Assam. 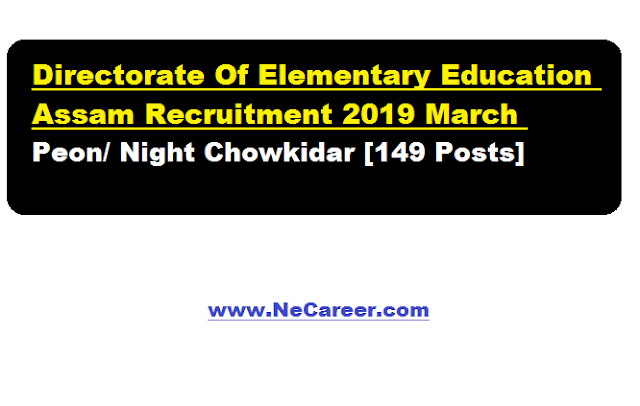 DEE Assam has issued a job notification in March 2019. According to the recruitment, online applications are invited through the official website www.dee.assam.gov.in from the candidates who are citizen of India as defined in Articles 5 to 8 of the constitutions of India and permanent resident of Assam for filling up of the Grade IV vacancies under the Directorate of Elementary Education, Assam. Pay: Pay Band-I @ Rs. 12,000/- Rs. 37,500 + Grade Pay Rs. 3,900/-per month plus other allowances as admissible under rules. Educational Qualification: Candidates must have studied up-to Class-VIII. Candidates must apply online through the official website of the DEE, Assam, i.e. www.dee.assam.gov.in. Candidates are required to apply in prescribed form through online mode only. No other mode for submission of application is allowed. Any change or amendment to this Advertisement will be posted on website only. Incomplete applications will be summarily rejected. The names of candidates who successfully submits the online application will be published in the official website of DEE, Assam i.e. www.dee.assam.gov.in in due course of time. They will have to go through the document verification process showing all relevant documents in original along with a set of self-attested photocopy of testimonials for submission before the respective District Level Selection Committee. (a) Receipt of Online Application. (b) Educational Qualification Certificate and Marksheets. (d) Proof of Permanent Residence. (e) Certificate issued by competent authority prescribed by the Govt. regarding their status as SC/ST(P)/ST(H)/OBC/MOBC. (f) Discharge Certificate (applicable to Ex-serviceman only). Reservation for Ex-serviceman will be maintained as per existing rules of the Govt.